Cast your mind back to early September early last year. Its a bright sunny Saturday morning, but the signs that it is first weekend of September are there, there is some insect life, but not the hordes you get in the peak numbers of May and June, there are some flowers, but many have gone over and the birds are hard to spot having finished raising their broods weeks ago. 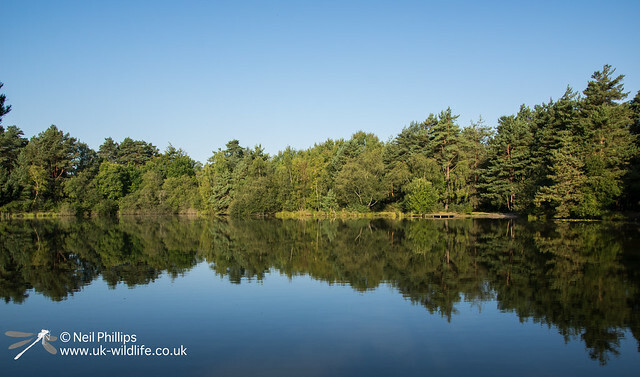 I stepped out of my car at Thursley Common NNR in Surrey, a favourite site of mine and one that has records more species of dragonfly than any other site in the UK. Next to the car park is the Moat Pond, sadly showing signs of becoming a dog paddling pool and in terms of aquatic fauna a shadow of it former self. Thankfully it still hold a good population of brilliant and downy emerald dragonflies, though my visit is long after their flight period. Still it offer a fine view to start the morning. 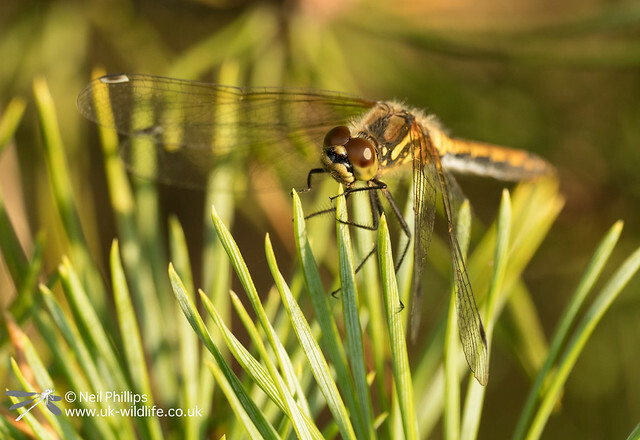 I thought I would set of for a quick walk before having breakfast and, other than the trail of wood ants, the first thing of note I see is a black darter dragonfly. Not a great perch for a photo but my first for a couple of years of this bog specialist. One of the main reasons for my visit was to see a personal favourite species/obsession of mine, a (bog) raft spider. A walk along the western most boardwalk revealed 2, one in a reasonable spot to photograph, though at a distance, so I tried a backlit in the habitat shot. 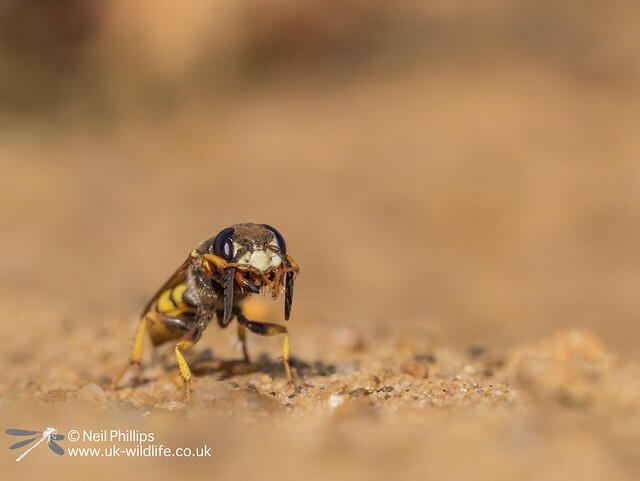 These predatory spiders sit on the waters surface waiting for prey to pass by on or just below the surface, including dragonflies! 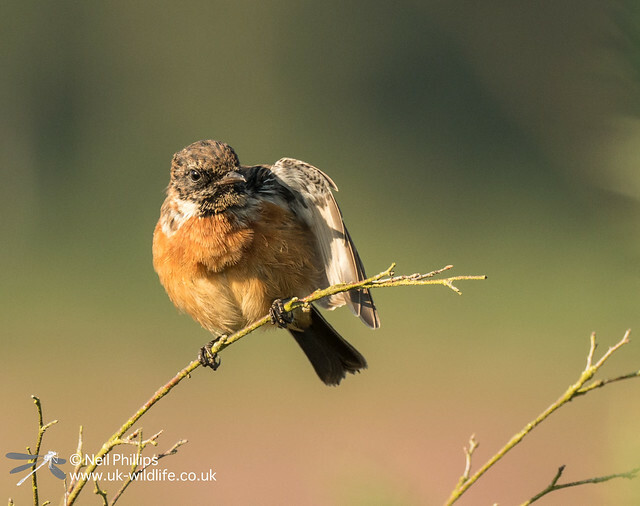 Walking along the path looking for invertebrates warming themselves in the sun I spotted a small bird. 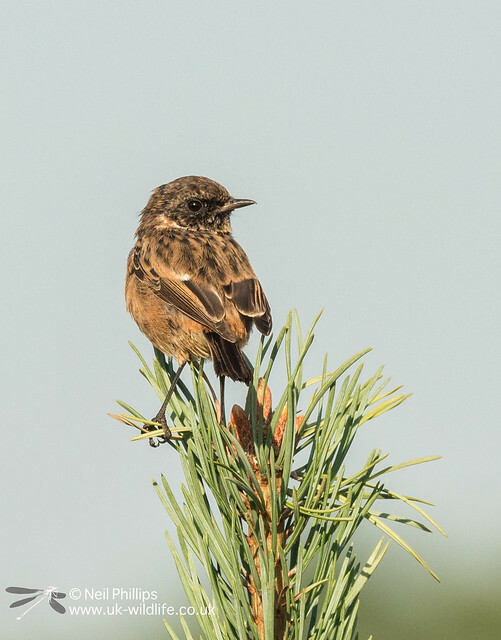 It was a stonechat. It kept it’s distance, but I managed some shots of it preening. I then spotted another bird nearly in a nearby sapling. I couldn’t work out what it was to start with, clearly a warbler though. Initially, with it shaded by leaves, I thought it was a juvenile whitethroat, but I then saw the adult as they small flock flew off. 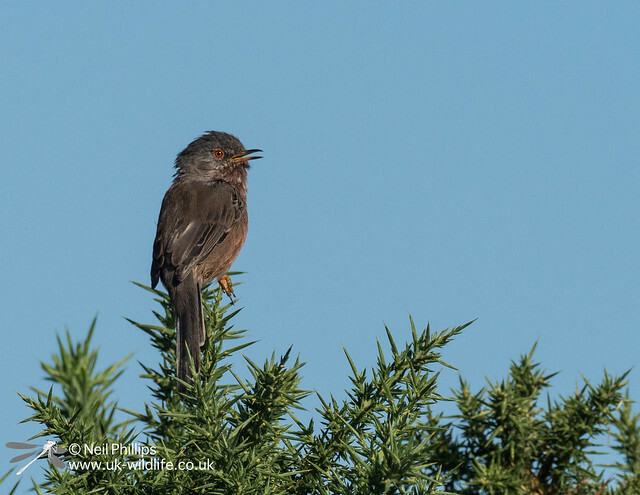 It was a family group of Dartford warblers and one adult posed for me. 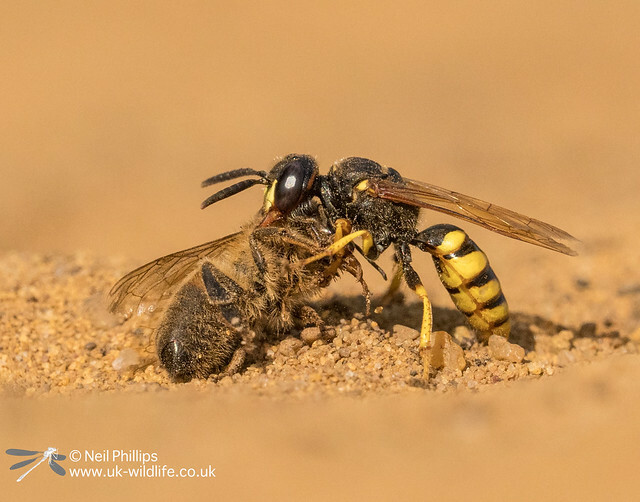 I then headed further into the reserve and after a brief glimpse of an Ammophilia caterpillar hunting wasp, I found another of my target species, a bee wolf. 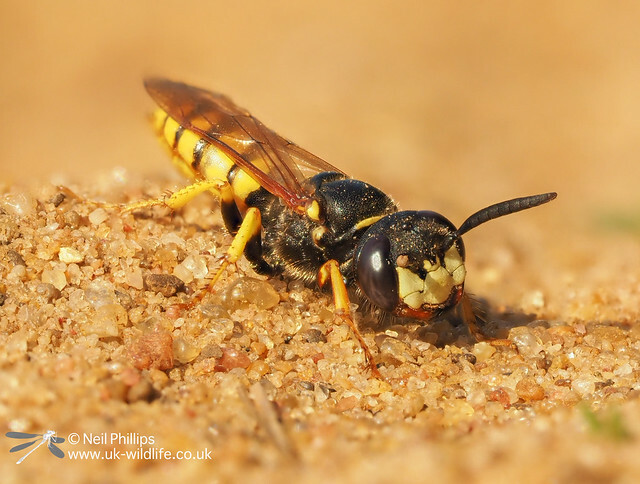 I have written about these predatory solitary wasps before and it is always a treat to see them. They were just warming up and I managed a few shots of them. 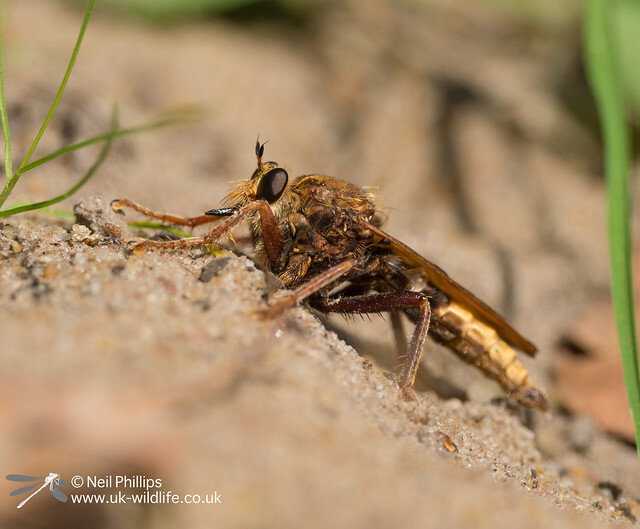 I then set off to look for another target, the hornet robberfly. 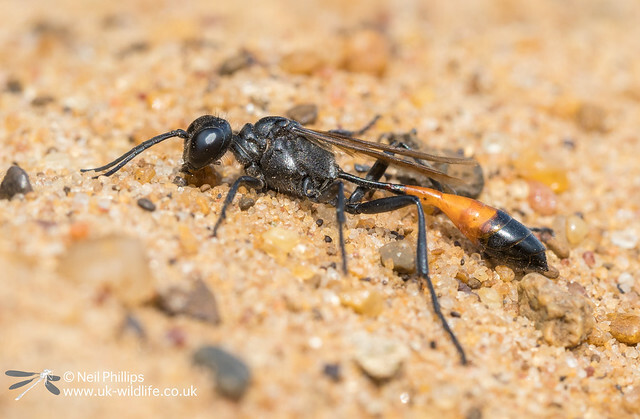 This species is probably our biggest species of true fly (Diptera) and my first encounter with on was at this site, when I witnessed one take a grasshopper in mid air! I did manage to find one, but this species is very flighty and it took off before I got any good shots. 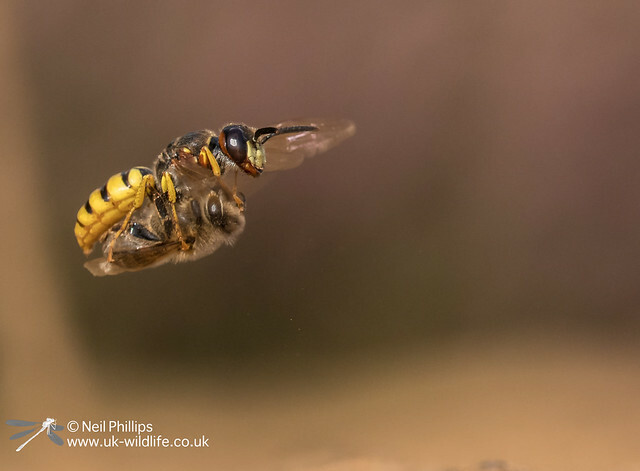 We ended up back the bee wolf area and there were now even more flying around. 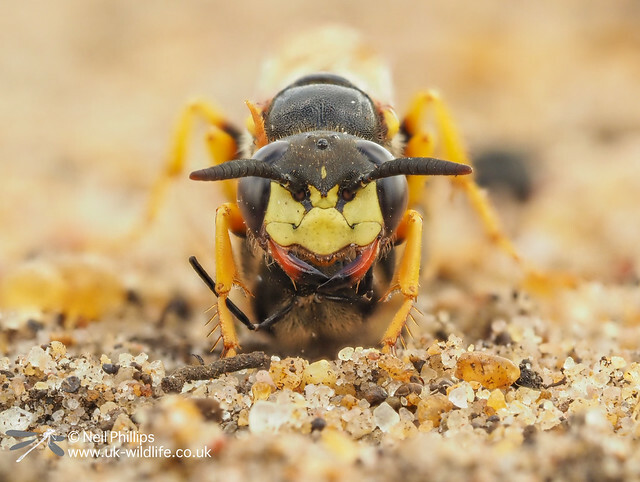 I tried for some stacked shots of females with prey. 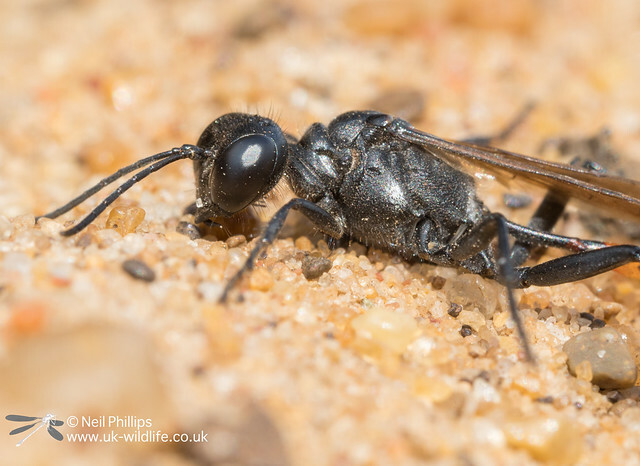 I also found another Ammophilia wasp and this one satyed still for some shots. 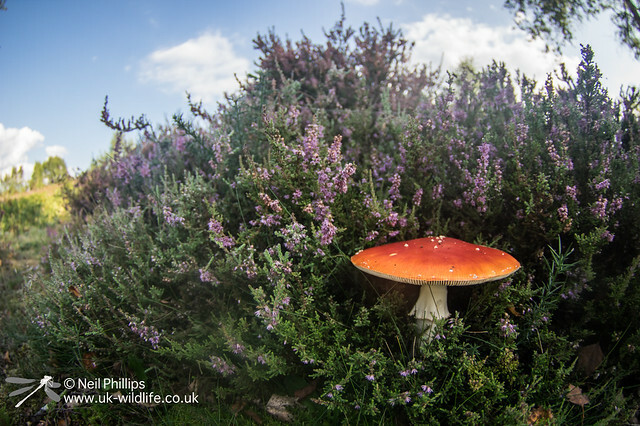 By now it had gone midday and I decided to head back to the car to have a (very!) late breakfast and top up my water supply on this warm day. 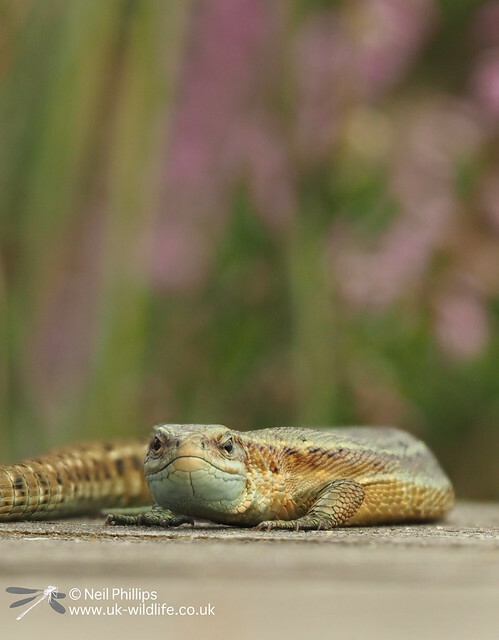 On the way back we found one of the common lizards often seen basking on the boardwalks. 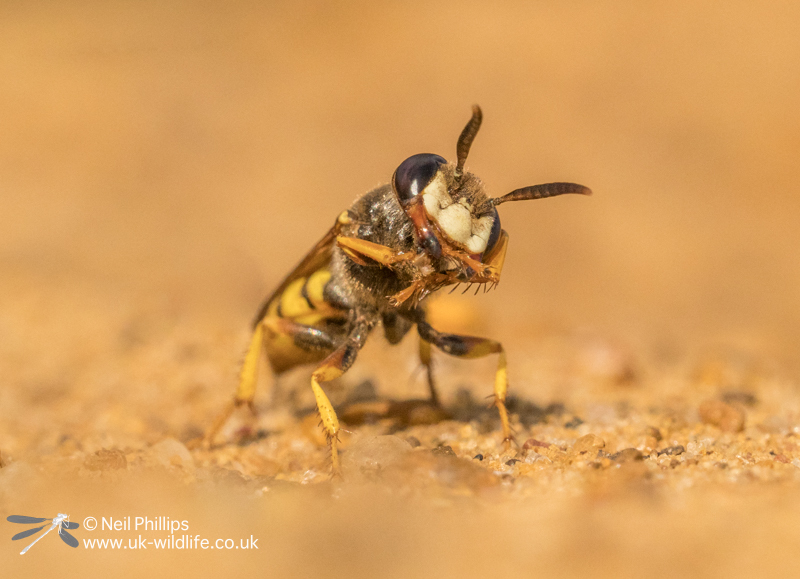 In the afternoon I set off to find another hornet robberfly or two, heading much further into the reserve that I had previously. 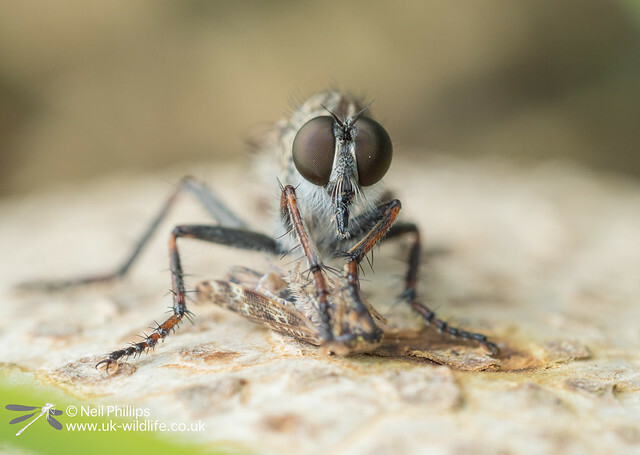 Previous visits were focused on dragonflies and raft spiders so I stuck near the boggy areas, but I would have to look further afield for robberflies. 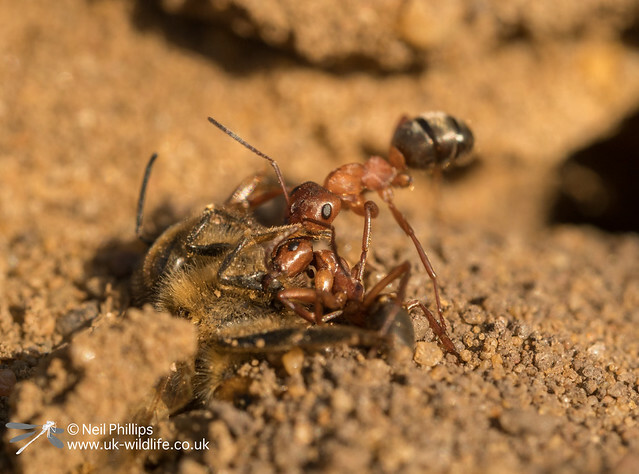 Of course, as often happens in wildlife photography, another subject distracted me. Bee wolfs again! 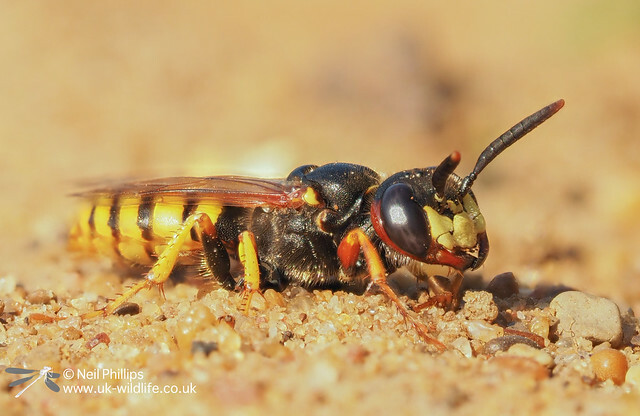 This area had the densest concentration I had seen of this species and I spent a good hour photographing various behaviours, including trying to get them in flight with prey and film video. As I continued my exploration of the new-to-me areas we found a stand of birches and a fungus often associated with this tree, a fly argaric. 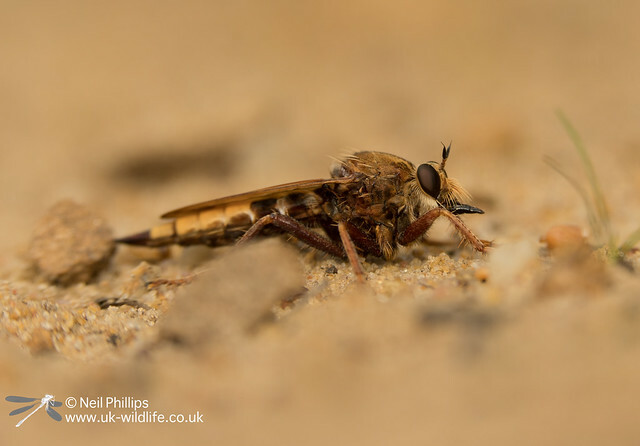 I pretty much reached Thursley village before heading back in the rough direction of the moat, with no sign of any robberflies. 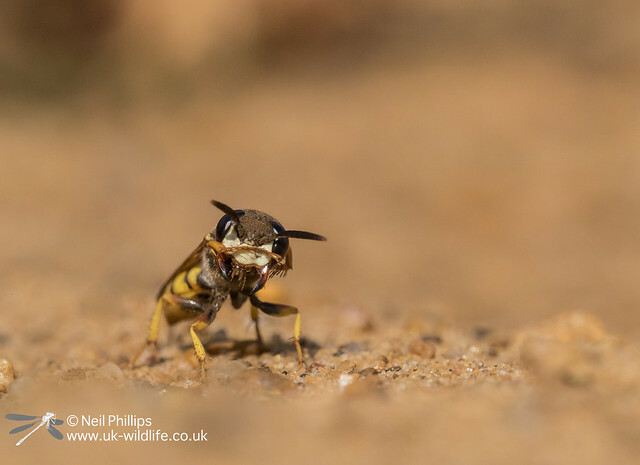 Then just as we came near to the field where we had seen the other hornet robberfly, there on the path was a bigger specimen. Annoyingly it was right next to a blade of grass limiting the angles I could get a clear shot and some stones in the way of the perspective remaining, ruining the shot. Then as the sun went behind a cloud it flew off and was not seen again. I would have to try again next year. 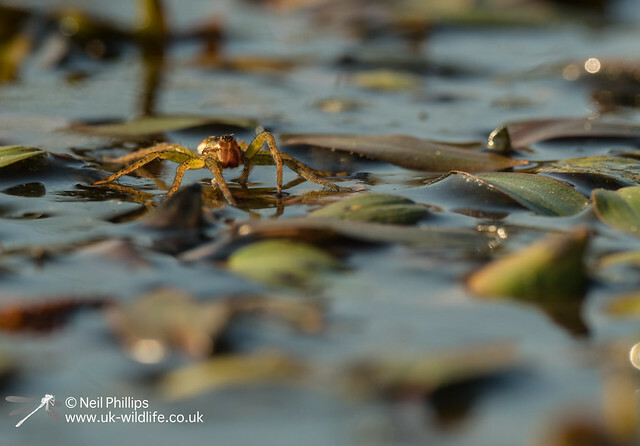 On returning to the car I popped out with my net and caught a raft spider to photograph in my surface dweller set up, but that is the subject of my next blog post.